Ectoparasites-arthropod ectoparasites (arrows) with epidermal hyperplasia and hyperkeratosis and dermal inflammation in a female B6C3F1 mouse from a chronic study. With current animal care standards, ectoparasitism ( Figure 1 and Figure 2 ) is rare in mice and rats. Myocoptes musculinus, Myobia musculi, and Radfordia affinis are the most common fur mites in mice. Psorergates simplex, the mouse follicular mite, is rarely seen. Radfordia ensifera and Ornithonyssus bacoti occur in rats. Rodent acariasis often involves the head, shoulders, and back. 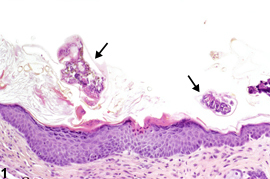 Typical lesions caused by mites consist of epidermal hyperplasia with hyperkeratosis and minimal chronic or chronic active dermal inflammation ( Figure 1 ). 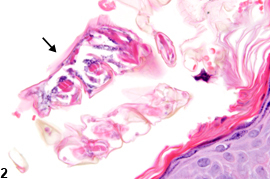 In severe cases, ulceration (usually due to self-induced trauma) with secondary bacterial colonization may be present, which can result in systemic amyloidosis in mice. Whenever present, ectoparasitism should be recorded as “Skin – Ectoparasites” but need not be graded. Acariasis may be accompanied by inflammation, epidermal hyperplasia, hyperkeratosis, ulceration, amyloidosis, and bacterial colonization, which should be described in the pathology narrative but not documented as separate diagnoses. Percy DE, Barthold SW. 2001. Pathology of Laboratory Rodents and Rabbits, 2nd ed. Iowa State University Press, Ames.